Sports streaming service DAZN has appointed its Italian chief, Veronica Diquattro, to take charge of its new Spanish service as well. 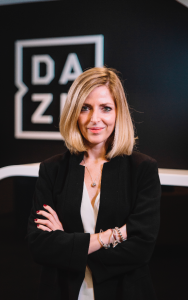 In the new role of EVP, revenue, southern Europe, Diquattro will lead DAZN in Spain alongside her current role as head of Italy, where the sport broadcaster has an extensive roster of premium rights, including Serie A TIM, Serie BKT, La Liga, Ligue 1, FA Cup, NHL and NFL. She joined DAZN from Spotify last summer where she was managing director, Southern and Eastern Europe, responsible for driving the music streaming service’s strategic direction and growth in 16 countries. DAZN will debut in Spain next month. The outfit has secured exclusive multi-platform broadcast rights for MotoGP from 2019 to 2022, Premier League football for the seasons 2019-20 to 2021-22 and Turkish Airlines EuroLeague basketball from 2019-20 to 2022-23. DAZN said that more premium rights will be confirmed soon, with the service due to go live for the start of MotoGP season with no long-term contract required from subscribers.